Got any old 8mm film reels or photo slides you want to get rid of? | How can I recycle this? Got any old 8mm film reels or photo slides you want to get rid of? 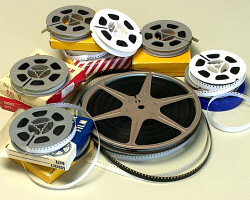 Hi everyone, I am now after any old 8mm film reel or any old and unwanted home movie footage on video or film. Also any old photo slides as we need them for a film project we are doing but it has to be your images such as old family stuff as we cannot use any copy written stuff. Doesn’t matter what of and from where as we will use bits if you know what I mean. Send to me at ACT,West House, Lombard Street West, West Bromwich, West Midlands B70 8EG. 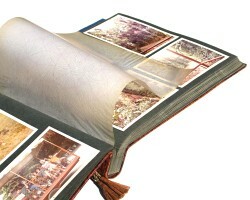 Wendy Russell from She’s So Crafty (HGTV) created bases and pots withthis side of film. 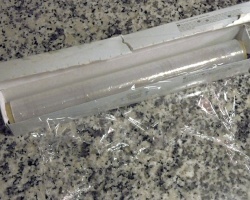 Removing the film from the reel roll up (in the same flat shape as it was on the reel). Holding the film with you finger tips carefully push the film outward near the centre. The further you are from the exact center the wider will be the diameter of the bottom of your finished bowl or vase. Shellac the inside and out. This is not a waterproof or food safe final product. 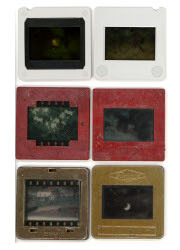 I´ve seen in a spanish web how someone created a lamp with old photo slides or films. I liked the light through the slides holes! We are collecting all types of “Media” – Video & Audio tapes, Computer disks, Floppy disks, cds, dvds, reel to reel, 8mm, records, etc. to be recycled. We erase the tapes (Degauss), strip them down to separate the different types of plastics, shred them then sell the plastic to companies to make new items! Dear John, Please come back to me suerobbking@gmail.com regarding videos etc. Hi gang we now want any unwanted films on 8mm or super 8 for showing at day centres and at community film shows any types/subject as in cartoon,or old comedy ones or? we recently for example received some very nice old British films showing some sports events as in football and boxing matches that type of thing ………we would also still like any old holiday or family films you may still have. Please call me on [number deleted]. EDITED by louisa: Nigel has asked me to remove his details. Thanks for all the offers over the years! Do you perhaps still have any available? Our school in Canada BC is having a movie themed prom and we arenin search of old round reels we can use. My sister lives in San Diego and could possible collect for me and post it to me. EDITED by louisa: Nigel has asked me to remove his details – they no longer need videos/tapes. Thanks for all the offers over the years! I would like to say a big thanks to all those folk who have sent me some slides, they are great so if you have any more please send them to me at [address deleted]. EDITED by louisa: Nigel has asked me to remove his details – they’ve moved offices. Thanks for all the offers over the years! If anybody has any 35mm movie film or photographic slides I would love them for a college project. I have approx 50 400ft reels of super 8 cine film of various holidays in the UK in the 60’s & 70’s if anyone would like them. Still got the super 8 films? Before disposing or repuposing the old film it may be worth checking the content. It’s possible there might be some unique content that might be usefull to a library or musium. If you are certain that the footage has no historical purpose then separate out any metal as it can always be recast. 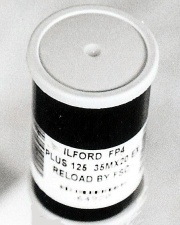 The film itself is problematic as it’s usually combustable, and contains many chemicals that restrict it’s effective repurposing. Are you still interested in super8 film? Ive a couple of dozen and hate to pitch it if it can be recycled. What will /du d you use it for? I have a few reels of 8mm exposed films I want to get rid of.anybody interested? Do you happen ro have any reels available still? Our school is having a movie themed prom and we are in search of the old round reels . I live in Canada BC and would pay for shipping etc.